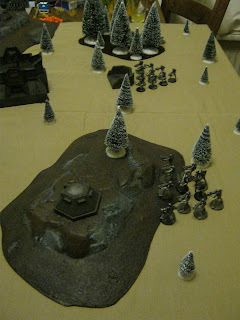 For the first mission, a 400point combat patrol, i took two squads of basic Necron warriors, a swarm of scarabs (6 bases) and a Storm Cryptek as the commander. 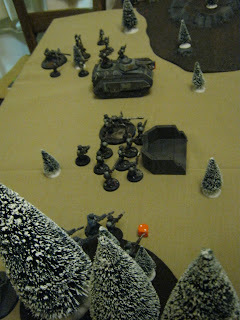 Peter fielded a rather kind imperial guard list with 1 chimera, used by the platoon command squad, two infantry squads of one which contained his commissar. Added to this he deployed a mortar squad and a special weapon squad with sniper rifles. We set up the battlefield similarly to last time, with Outpost 4-19 in the centre of a 4’by 4’ table. I got the first turn and advanced with my units, holding the scarabs back to avoid having them blasted form the field by the instant-killing multilaser and autocannons. 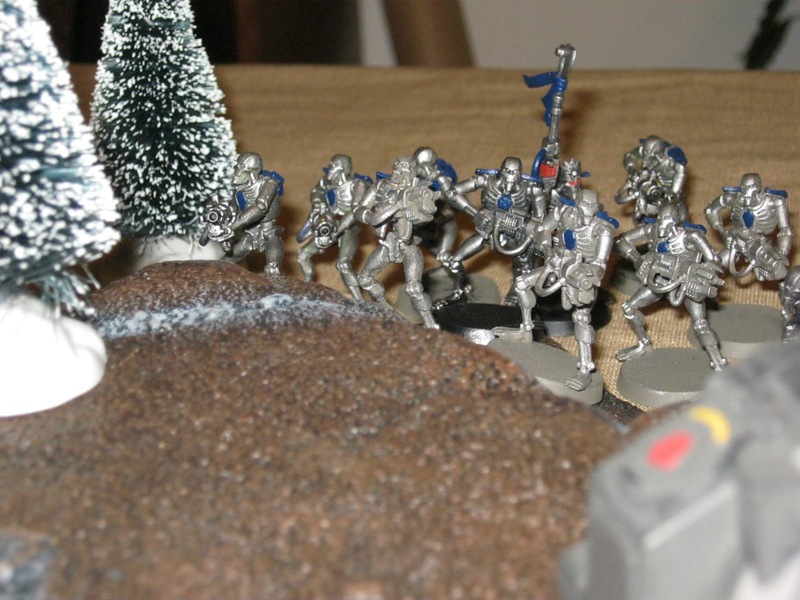 Because dawn had not yet arrived the human infantry was partly cloaked in darkness, and only a few of my robots managed to score a kill. 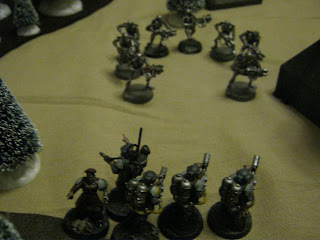 The gauss fire did manage to shave a hullpoint of the command chimera that was advancing slowly up the centre of the table. Next it was Peter’s turn to open fire. Using the faint traces of the emerging dawn one of the snipers took aim at a Necron carrying a large glowing staff, and accurately put a bolt right in one of it’s glowing eye sockets, causing it to fase out immediately (exit stage left for the Cryptek...He’ll be Back...). 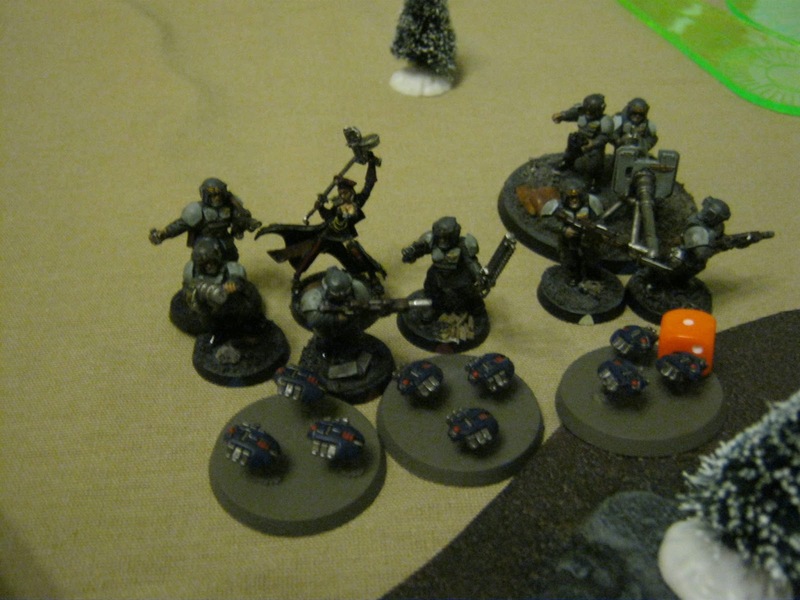 Subsequently lasgun and heavy weapon fire poured into the unit of Necron warriors that had been guarding the Cryptek. Mortar fire rained down from the skies, and after that torrent of fire only two remained standing. Only to see five of their fallen brethren rise again due to rather efficient reanimation protocols. Duting the following turns I advanced with my units firing a withering hail of fire into his infantry units and wrecking his chimera with gauss fire. The Scarabs meanwhile crept up the left flank, ready to pounce on the Commissar and his loyal guardsmen. 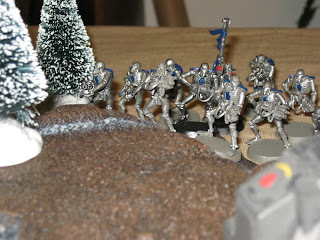 The Platoon commander emerged from the wreckage of the chimera with his flamer bearing retinue, who doused the offending Necrons in promethium. Unfortunately for the brave guardsmen (can you see where my heart lies?) only two of Necrons were destroyed by the fire. 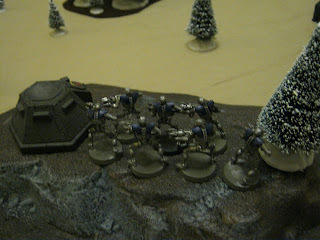 The following fase saw my scarabs plunge into combat with the commissar and the platoon command squad die in a hail of gauss fire. Meanwhile the remaining units of Peter’s guard were trying to secure his right flank by firing everything they had at the oncoming Necrons. Three of which continued to advance and clash with the mortar squad. 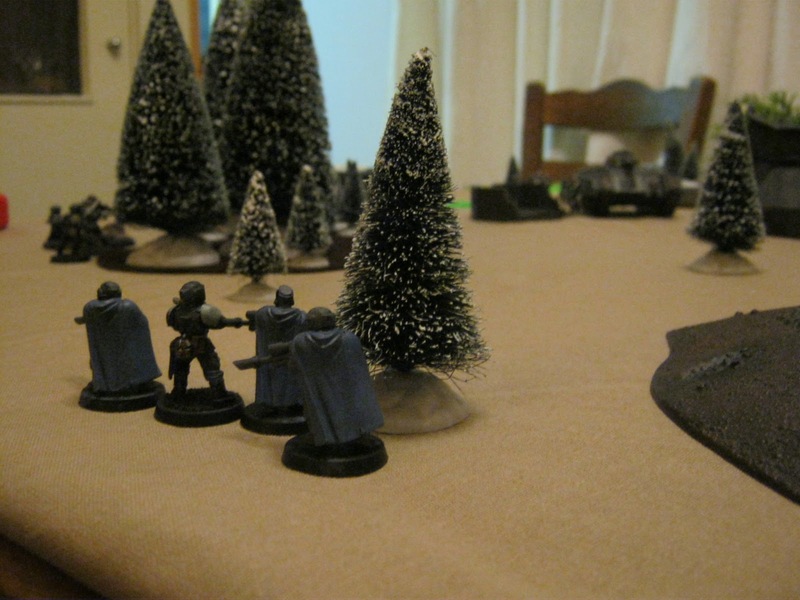 Some rather abysmal dice rolling on peter’s side saw the combat between the two units drawn out over several turns, with the snipers joining in the fray and even an remnant of a infantry squad joining in. Eventually the mob of guardsmen took down the last Necron, clearing their table quarter just as I killed the commissar and his bodyguard. That had us both at 4 VP (a table quarter each, First Blood for Peter thanks to the deadly sniper fire and a Linebreaker VP for me). Nice read! i am ready for the final confrontation.